It’s become an annual tradition to spend New Year’s on a trip with friends. New Year’s Eve also happens to be my birthday, which I love to share with the world! My husband and I usually start planning really early, but 2016 was a whirlwind and there wasn’t a whole lot of time to breathe. At the last minute we decided on a flight to Cancún because it’s great weather in the winter and the flights and hotels are relatively inexpensive. It’s definitely been a year of tropical vacations! We decided to stay in Playa Del Carmen at an airBNB, about an hour south of Cancún. Cancún Limo (side note: they also provide vans) was waiting for us at the gate which made it easy. No negotiations, just a nice clean ride with AC to take us to or destination. Highly recommend! The seven of us arrived at our Airbnb near downtown at about 8am immediately realizing we couldn’t check in until 3pm. There we were, seven people with all our luggage and lacking sleep. Poor planning. We headed to the first resort we could find to try and check our bags. They wouldn't let us check them unless we purchased a day pass for $105 per person for the day. The Royal is a massive resort right on the coastline. It's gorgeous and the day pass included free drinks, food, pools, and cabanas all day. Game on! It was absolutely the right decision. Since it was early we snagged a few open cabanas in the shade to nap. We ate delicious meals at the seaside restaurants, drank endless margaritas (Maria Marie was my fave), and swam in the cascading pools. I'd say we came out on top! Love Life Jewelry and Sunskis, perfect for a beach vacation. #teamcrazybeaches, because every group trip should have an original hashtag. Looks like the new iPhone can be submerged. Bam! Ice blended margarita. Yes please. All in all, we had a blast dancing with the cows until about 4am. Not sure I’d make a return trip to La Vaquita, but it was memorable nonetheless. We woke up late. Really late. I wonder why? Trying to rally a group of seven is always a struggle. We finally made it out at about 12:30pm. Many of us were hangry, but we were hoping to make it to a restaurant in Tulum for lunch, one hour away. We stopped for snacks and coffee then left on the Colectivo, a minivan that’s $2 US and very easy to find. 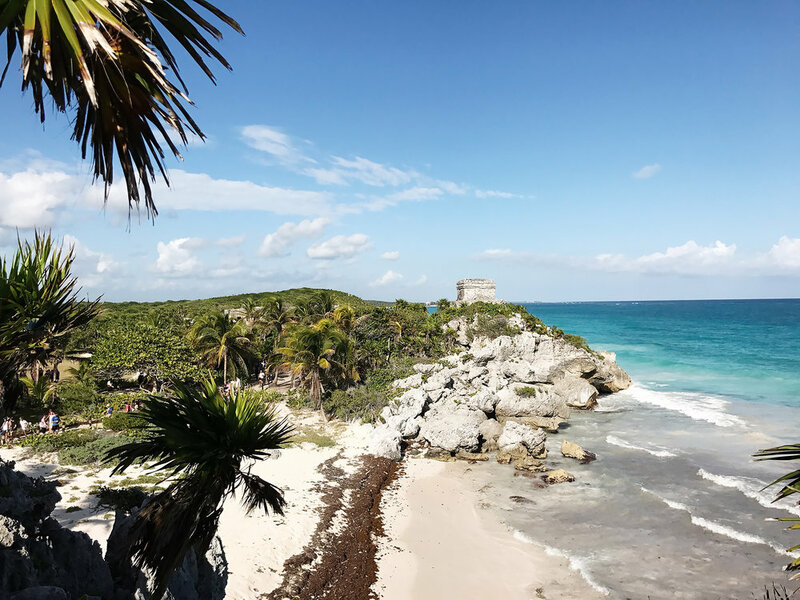 There are two areas of Tulum, the ruins and the downtown. We didn't have time to grab lunch 20min away and still see the ruins. Since we got dropped at the ruins, we purchased a package that included entrance fee, a boat ride, and snorkeling for $25US. This meant starving ourselves for a while longer so we could walk through and see the ruins on our way to a closer lunch spot called Pancho Villa. Temples lie on the cliff's of Tulum overlooking the Carribean Sea. There are ruins behind us. They just didn't make it into the photo. Photo fail. At least we look cute. We wandered through the ruins by the sea, catching sight of all the iguanas blending into the stonework. The ruins are really beautiful, but the beach they tower over is breathtaking. A gradient of blues that meet with the white sandy shoreline. Pristine white beaches of Tulum. When we reached Pancho Villa, a cute little beachside abode, we were ravenous. It was around 4pm and none of us had much food in our bellies. We ordered quickly because we were supposed to ride a boat out to sea by 5pm. After a long wait, we snacked on quesadillas, guac, and nachos, but had to cancel our ceviche because the wait was too long. Mexico time. Service is sloooooow. We rushed to catch the boat and ended up having to wait for a 5:30pm ride. The sun was dipping to the west behind the mountains and were running short on daylight. We finally got onto the boat to see Tulum ruins from the sea at sunset and it was beautiful. Snorkeling was also an option but with the dying light we knew there might not be much to see. A few of us opted to stay dry for our dinner trek to downtown Tulum. Unpaid advertisement. Your welcome Corona. Downtown Tulum is incredibly touristy, but I love it! It had world class restaurants and beautifully merchandised little shops all down the main strip. As an Art Director, the beauty of it all gets me giddy with excitement! The ambiance is spot on. We went to a placed called Hartwood on a friend’s recommendation. It was chaos, and there was no way we were getting in without a rezzie. We started down the street looking for something else and came across a restaurant that was beautifully lit with great music and a chill vibe. We asked the host if he had room for seven. He said they didn’t have space and most restaurants around wouldn’t either. We were silly to think that we could walk into a restaurant at peak season with seven people... but then a twist of fate. Our friend chimed in to see if they had any spots at the bar, long shot. Out of the corner of his eye, the host spotted something, and told us to hurry over. We rushed to an almost hidden area to the right of the bar with just enough space for us. It felt like our own private VIP lounge. Score! Gitano had some amazing mescal cocktails and the food was delish! The service was slow but the ambiance was so majestic it didn’t really matter. We were happy to have found a spot for all of us to enjoy the evening in Tulum. Early to rise on the third day of our trip. It was time for a planned tour with Altournative to Ek Balam and Cenote Maya. We rode 2 hours northwest to the Mayan ruins. We chose to go to these smaller ruins over Chichén Itzá because they would be less crowded and you could still climb the temples. There is also one of the best preserved stucco facades in Mesoamerica. Stucco figures were excavated in nearly pristine condition, having been carefully buried by the ancient Maya about 1200 years ago. We learned about the Mayan culture from our guides. Very interesting culture of massive advancements in society while in contradiction worshipping disfigurement and human sacrifice. We explored the grounds and ascended the main temple. The steps to the top of the main temple are really steep with no railing. It can be a little dizzying for most looking down the narrow steps, but the view from the top is spectacular and worth the trek. Temples rise out of the forest greenery. The climb was steep but worth the view. After the ruins we rode through the Mayan cities, which was a great contrast to the grandeur of the temples. Small low ceiling shacks, more of a burrough than the palaces of the past. We arrived at Cenote Maya 45min later. Altournative, the company we booked with, works to improve the economic, social and cultural development of various Mayan communities. They employ a lot of locals to help the economy and to educate and preserve Mayan culture and traditions. The “park” premisis is amazing. We were greeted with a short mayan ceremony and then escorted through a beautiful organic garden to a buffet of traditional Mayan cuisine. After lunch we changed into our swimsuits to head into the Cenote Maya. A cenote is a “natural pit, or sinkhole, resulting from the collapse of limestone bedrock that exposes groundwater underneath.” As part of the experience, we got to repel into the cenote. We descended from the earth into the cavernous structure with tree roots diving down into the water, and crystal clear fresh water below. It seems otherworldly. I was really disappointed I couldn’t bring my GoPro, but fortunately they have some photographers down there taking candids the whole time. The downside, you have to pay for them. The upside, you’re helping employ some locals! And honestly, they did a great job at capturing great moments and most of the time we didn’t even know they were shooting. We arrived back at our airBNB apartment at about 6pm and cracked some beers on the rooftop terrace to relax for a short while before our 8:30pm dinner reservation. We made our way back over to Catch on 5th to enjoy another rooftop for dinner. The food here was the best I had on the entire trip. The prices are pretty high, but the flavors match the price. We had an assortment of scallops, sashimi, crab, steak, and ceviche. It has a very West Hollywood kind of vibe, rooftops pools lit with purples and pinks, palm trees, and candlelight. Everything was pristine and the wait staff was attractive and well dressed. I can't say I love this vibe all the time, but once in awhile it’s a nice change of pace. My birthday! Some of us were supposed to wake up early to go diving. Between being exhausted from all the activity and the looming sky above that looked like rain, we canceled and slept in. Around 11am we rallied to go out and poke around downtown Playa Del Carmen. As we hit the main road the guys took off to eat, drink, and be merry while the girls went shopping. PDC is fixed pricing so no bargaining here, which I prefer, because I’m terrible at it. The prices were very fair, I got three really nice ornaments, a stuffed animal, a baby girl dress, and some chums for $30. Then I went down the way and got some killer leather huaraches for $35. We found the boys having some beers at a bar and joined them for lunch. Then back to the place to get ready for the countdown to 2017! We went to El Muelle for a fixed price dinner at 7pm. We were definitely the early birds. I forgot that in latin culture people eat later. After eating at Catch the previous night, I felt like El Muelle was just fair. The main course seafood assortment was a little bland. We decided to move on for our next post dinner cocktail. We stumbled upon a restaurant that was moderately empty. As we sat sipping at the bar a karaoke singer set up, and before we knew it the party got started. This guy was a riot and got us all doing the merengue and singing along to Spanish hits. Looking back this was my favorite part of the night. We went to Mamita's night club for the countdown, where we had reserved a table on the balcony overlooking the beach and a massive stage. We danced the night away from some new friends from San Francisco until the wee hours of the morning. DJs, fireworks, and vodka tonics! Cancún Limo picked us up at noon to drive us to The Westin Cancún, where we’d spend our last night. It was an early flight at 8am so we wanted to be close. We arrived and had lunch, then sprawled out on some lounge chairs by the sea for some much needed relaxation time. The ocean on the Yucatán Peninsula is a gorgeous bright blue. We each took our turn to jump into the sea. We had been in a pool, and a cenote, but we hadn’t been in the ocean yet! I was feeling ashamed we hadn’t made it in yet, but we had jam packed our four day trip. We showered to head to our 5:45pm rezzie at Fred’s House, which a friend had recommended. We were a bit late and almost lost our cabana spot. In order to see the sun set over a body of water you need to be overlooking the Nichupte Lagoon. This cabana is right on the lagoon and absolutely stunning. It feels really tropical and they are known for their fresh fruit cocktails. For an upscale restaurant the prices were really reasonable. About $7 for one of these drinks, and main courses starting at $12. There is a lot of fresh seafood on the menu and very friendly staff. It was an great way to end our vacation! 7 friends. 5 days. 4 cities. Countless drinks. 2 mayan ruins. 1 cenote. And a partridge in a pear tree. If you have have any questions, feel free to ask in the comments below! Amboy Crater is a 6,000-year-old cinder cone volcano that rises above a lava field. I loved seeing all the plants spring up from the black lava forms. New life sprouted from the darkness. An Interview with artist Rachel Farabaugh on finishing a year of road tripping in her 87' Chevy Lindy and finding a new place to call home.